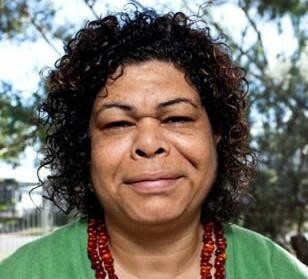 Andrea Mason is a Karoni and Ngaanyatjarra woman and CEO of the Ngaanyatjarra Pitjantjatjara Yankunytjatjara (NPY) Women’s Council. Andrea was one of three participants in Jawun’s 2017 Indigenous Corporate Leadership (ICL) program, a ‘reverse secondment’ of Indigenous leaders to leading corporate companies. Andrea participated in the ICL program to achieve a three-part goal: increase business acumen; develop awareness of business fundamentals; and, build stronger connections in the business sector. She was keen to integrate business knowledge into service delivery, to better support Indigenous women across the NPY Lands and to decrease the organisation’s reliance on government funding. Her secondment was at The Westpac Group, Sydney. While the world of banking and corporate business was new, Andrea brought with her extensive leadership experience as well as expertise. On secondment she provided feedback on key plans including the Westpac Indigenous Engagement Strategy, and spent considerable time with the Indigenous Business Banking Team. As part of supporting the bank to improve customer service and delivery in Indigenous banking, she launched Advocacy All Stars, a St. George Group initiative to spark a renewed customer service focus in bankers and support staff. Andrea also offered strategic and practical advice to a range of senior managers and department heads within the Westpac Group, based on her knowledge of Indigenous culture and governance, her leadership experience, and Indigenous perspectives on banking. As an indication of the reach of the program at the end of her secondment Andrea delivered a final report to Westpac CEO Brian Hartzer. Anthony Mathews (Chief Operating Officer) was Andrea’s direct manager at St. George Group. During the secondment, Andrea invited Anthony to join her on a visit to the NPY Lands and the two spent time visiting communities. The visit gave him practical insights into how Westpac Group can develop financial literacy among Indigenous people in remote environments, adding direct value to the bank’s support for Indigenous customers. It also showed him the context Andrea would apply her ICL learnings to. After completing the ICL program in December 2017, Andrea resumed her role as CEO of NPY Women’s Council, while continuing her role as co-chair on the Prime Minister’s Advisory Council. Applying her ICL learning, Andrea is focused on developing strategies and business ideas to increase revenue for the organisation. The goal to become less reliant on government funding is still a focus for her. “Visiting Andrea’s home in NPY Lands gave me a whole new perspective on how to be a better leader and also a better banker in terms of our customers. Having grown up in metro areas, I was solely focused on the needs of metro-based customers. Now I am able to think broader on how the ideas I have and decisions I make could impact broader communities across Australia”. Overall Anthony remembers, “Andrea was a mentor to me as much as anything”. Since the end of ICL he has taken on a more complex role with greater leadership responsibilities. He has seen his team retain the ‘diversity of thought’ gained from working with Andrea. And Advocacy All Stars is still recognised at St. George (plus has inspired a Recognition Program at NPY Women’s Council). “I have continued to really take more opportunities in my learnings. I feel I’ve matured, and become a lot clearer in my ideas”. While this is currently being developed and supported by the region’s Empowered Communities agenda, Andrea expects her plan to strengthen support to the region’s young female leaders to come to the fore next year, 2020, when NPY Women’s Council celebrates its 40th year of operation. After the success of Andrea’s secondment, Westpac Group went on to host Bardi leader Nolan Hunter from West Kimberley in the 2018 ICL cohort. Nolan joined the Agribusiness team, with a focus on strategy and economic development. His case study can be found at [link].